Frameworks are built in 40-micron layers of CE marked cobalt chrome powder and built by laser powder bed fusion (PBF), using an ytterbium fibre laser. 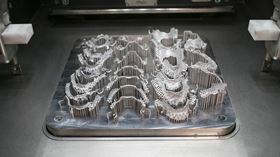 Renishaw has partnered with an Australian dental laboratory to install what is thought to be the first metal additive manufacturing machine for dental applications in Australia. Before working with Renishaw, dental laboratory Proslab introduced a partially digital workflow, using 3D scanning and design tools to design dentures. Once designed in CAD, the dentures were printed in resin and manufactured in cobalt chrome using traditional lost-wax casting, a traditional method which can reduce part accuracy due to uncontrolled heating and cooling, varied cross-sections and incomplete casting or gas porosity. As a result, Proslab turned to Renishaw to fully digitalise its manufacturing process using additive manufacturing (AM) and purchased Renishaw’s AM 400 metal AM system. The machine enables the production of removable partial dentures directly from a CAD file, eliminating the additional casting step. Frameworks are built in 40-micron layers of CE marked cobalt chrome powder and built by laser powder bed fusion (PBF), using an ytterbium fibre laser. According to Proslab, directly printing from a CAD file reduced the number of in-house remakes due to error by 100%. Amann Girrbach says that it will integrate one of 3D Systems’ additive manufacturing (AM) machines into its Ceramill System. 3D Systems has launched two new 3D printers for metal additive manufacturing (AM). Tech Soft 3D says that its software development toolkits can be used for CAD translation, visualization, modeling, and mesh processing.